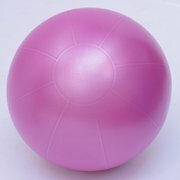 Exercise balls are one of today's top fitness tools - and for good reason! Using an exercise ball will improve the strength of the abs and the lower back. Since the exercise ball is unstable you have to constantly adjust your balance, which in turn will improve your balance, proprioception and flexibility. Widely used by fitness trainers and athletes, the Theragear Swiss Ball Pro is designed especially for use with added resistance like dumbbells. Theragear exercise balls are made with a special material that prevents the ball from dangerously exploding if accidentally punctured, they have a non-slip surface and are latex-free. If you have any questions about this product by TheraGear, contact us by completing and submitting the form below. If you are looking for a specif part number, please include it with your message.